SUMMARY: Armed with an M-16 and her brother's teddy bear, sixteen-year old Cassie believes she may be the last human on earth amidst a devastating alien invasion. REVIEW: One of my favorites of 2013! Intense and violent, The 5th Wave isn't for everyone. The writing is superb, and while there are only a handful of major characters, they are each well-developed and memorable. Viewpoints alternate, and the reader doesn't always know who is talking right away. Sometimes, the speaker is a new character, and in one instance, the speaker's identity isn't revealed until the last part of the section. I actually gasped out loud on that part! Rick Yancey has a knack for unfolding this alien-infested world slowly and with detail. He takes his time crafting a terrifying world where humans are on the verge of extinction. The methodical way the aliens "take care of business" is just chilling, and I love how Cassie wonders if our planet were destroyed, would humans do the same to another less technologically-civilized alien culture? Would we really be any better than these aliens are? Wouldn't we also do everything it takes to survive? Truly, there are authors and there are AUTHORS. Lots of people write interesting stories that are good, but there are only a few that really knock my socks off. The 5th Wave rockets its way past 99.5% of all books published this year--it's just in another league entirely. I've seen it compared to Stephen King's The Stand, and I can see that comparison. Seriously, The 5th Wave is so much more than a YA post-apocalypse novel; with movie rights already sold to Sony Pictures, I have zero doubt that this one will still be popular, even 20 years from now. 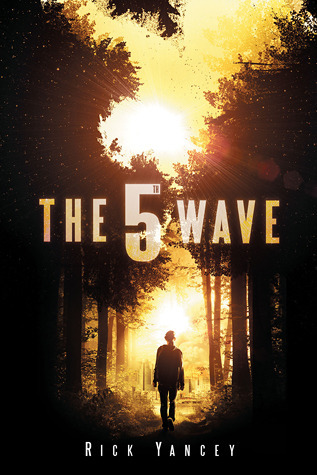 A word of warning--The 5th Wave is extremely intense and violent. I can't say that enough--there will be many who will be understandably disturbed by the violence. THE BOTTOM LINE: A crazy-amazing, violent story that holds its own with books like The Stand, Gone, and even 1984. It will appear on many, many end-of-2013 "Best of" lists. It will also appeal to adults--even those not into YA. STATUS IN MY LIBRARY: Though this book is more a high school book than middle school, I plan to get it for my library. It's a great choice for all those 8th grade boys who love Michael Grant's Gone series and Fukuda's The Hunt. Fantastic read! I loved how all of the characters some how tied together. And the fact Cassie was just a normal girl who felt real emotions and thoughts like a regular teenager. Oh! I am reading this one next! I will have to come back when I read it! Awesome Review. I have wanted to get my hands on this forever and your review has made me even more excited. I'm definatley going to use my upcoming birthday as a excuse to order myself a copy. 5 stars for every componet in the breakdown!! It must be a hit. Love the blog! @Pink Lady 631--You won't be disappointed--it really is THAT good! Love love love! I just finished this one and sort of in mourning that it's over. One of the problems of reading a book this good - it's hard to follow up. One of my favourites of the year too. @TerryLynn--Follow it up with All Our Yesterdays by Cristin Terrill. It came out yesterday. I'm about 200 pages in, and it is soooooo good!